Known commonly as solar panels, or just PV in the industry, they are the large flat, black glass panels that go on roofs to convert sunlight into electricity. PV cells come in a variety of shapes and colours, from roof and wall mounting panels to grey “solar tiles” that can look like roof slates. There are even panels available with the solar cells spaced apart to allow some sunshine through for conservatory roofing, for example. Installations on commercial roofs will require planning permission. However, In England and Scotland you don’t need planning permission for most home solar electricity systems, as long as they’re below a certain size – but you should check with your local planning officer if your home is a listed building, or is in a conservation area or World Heritage Site. 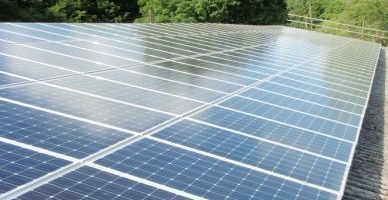 In Wales and Northern Ireland, you still need to get planning permission before installing a solar electricity system – though this may soon change. Solar PV systems can be supplied in virtually any size, and their output will be related to the area of the solar panels. An area of one square meter typically can house 100 to 180 watts peak of PV capacity. The productivity of solar PV does not vary greatly across the UK with typical levels between 1100 kWh per square meter in the South West, to 800 in the Scottish Highlands. Local variations are small and we have reliable meteorological records created over many years, so can predict annual outputs and the probability of year-to-year variations quite accurately.